THE FIVE BEHAVIORS OF A COHESIVE TEAM is an assessment-based learning experience that helps individuals and organizations reveal what it takes to build a truly cohesive and effective team in the most approachable, competent, and effective way possible. Powered by Everything DiSC®, the profiles help participants understand their own DiSC® styles. Bringing together everyone’s personalities and preferences to form a cohesive, productive team takes work, but the payoff can be huge—for individuals, the team, and the organization. Trust One Another: When team members are genuinely transparent and honest with one another, they are able to build vulnerability-based trust. Engage in Conflict Around Ideas: When there is trust, team members are able to engage in unfiltered, constructive debate of ideas. Commit to Decisions: When team members are able to offer opinions and debate ideas, they will be more likely to commit to decisions. Hold One Another Accountable: When everyone is committed to a clear plan of action, they will be more willing to hold one another accountable. 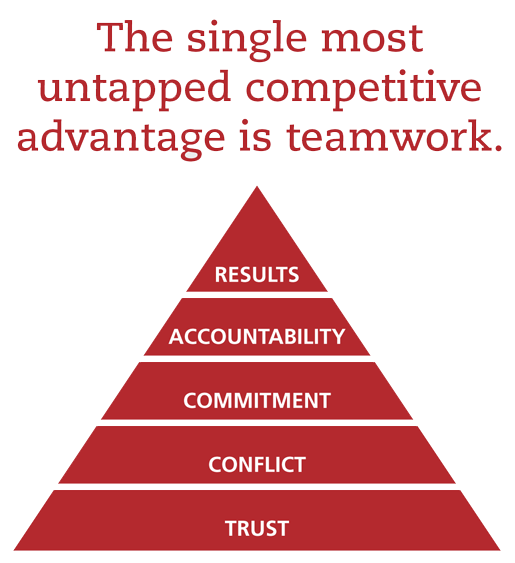 Focus on Achieving Collective Results: The ultimate goal of building greater trust, conflict, commitment, and accountability is one thing: the achievement of results. Want to receive more valuable information on leadership and other subjects that impact your work? Sign up for our monthly newsletter.